Reminds me, I meant to do something with the extra keys on my Sun keyboards but never got around to it. It's clearly a gaming board. Put on Quake keycaps. When you play the keyboard like a pro pianist, i.e. each finger is restricted to a few keys, then shouldn't you already know what's best for you? Where's the need for experimentation? I am not a pro pianist. I press the keys unmethodically. Any finger can press any key, but since I need to do it a lot and often, some patterns of convenience emerge for certain words, phrases, and functions. Also, it's convenient to have a familiar keyboard, so that I know by habit where my needed keys are and what key-pressing habits of mine are usable. Reality is a bit more complicated of course. I have to use many different keyboards in different places during different times of day, not just my preferred keyboard. This means I have to adapt my typing, and adaptation works best when habits and preferences are not too deeply entrenched. And really, I prefer ink, pen, and paper over any keyboard, but life has taken another turn. Must adapt to this too. The best keyboard is a familiar one. If the keyboard is not familiar, I prefer the keys be labelled properly and clearly so I can have realistic expectations in relation to the keyboard and adapt without too much hassle. I don't quite follow what you're responding to. If you mean, for instance, why I'd consider to "experimenting" with assigning something else to F1 than "help" the simple answer is that I find that a waste of a perfectly good function key. In Opera I've already had it defined as something else for years. However, I disagree with the author of the page I linked that Ctrl + Z/C/V is particularly problematic, and if modifier keys like Shift and Ctrl aren't pressed automatically without noticing it, you can't properly touch type (my apologies to people with disabilities; that statement may not apply to them). In my opinion, the only way to get "hand stress" there is if you incorrectly use only one hand. In any case, Caps Lock and F1 are almost entirely useless to me by default, making them prime real estate for remapping. Like I said, I've been using Caps Lock as Compose for years, but I've mostly been overlooking F1. That being said, I don't quite know what I'd do with it. I just know it's wasted on me and I should figure out a better use for it sometime. And really, I prefer ink, pen, and paper over any keyboard, but life has taken another turn. Anyone else here so ancient that you can remember when a keyboard was worth repairing? Nothing ancient about it. If a switch on my keyboard were to break, I'd solder on a new one. Partially because it'd hopefully be kind of fun, partially because unless I made over €100 an hour anything else wouldn't make the least bit of economic sense. If you mean, for instance, why I'd consider to "experimenting" with assigning something else to F1 than "help" the simple answer is that I find that a waste of a perfectly good function key. In Opera I've already had it defined as something else for years. If you can remember all those customisations, then it's not really experimenting For me, however, it would be. I am not a champion of keyboards, and I need to be able to type on several throughout the day. My customisations of keyboard behaviour involve only setting NumLk on or off at login on different machines, redefining Caps Lock, and making a few charsets available (Estonian, Swedish, Greek, and Russian; I never use US). This is already quite many elements of confusion, isn't it? Different programs have plenty of their own keyboard shortcuts that differ and are hard to remember. I usually go through somee trouble to harmonise the keyboard shortcuts and other configuration across programs I use most, but this is not to be done too extensively so as to forget how the program behaves out of the box, when I need to deal with the program on some other machine which is configured differently. There are some customisations that are best avoided. For example some people set rm as alias for rm -i and when they are on someone else's machine, the command they are used to won't work as expected. I have set del as that alias. However, I disagree with the author of the page I linked that Ctrl + Z/C/V is particularly problematic, and if modifier keys like Shift and Ctrl aren't pressed automatically without noticing it, you can't properly touch type (my apologies to people with disabilities; that statement may not apply to them). What finger would be on Ctrl? Pinkie? I usually press Ctrl with the thumb. I really need to make myself extra alert like "Hey, this is not normal typing. It's a keyboard shortcut!" to get it right. In my opinion, the only way to get "hand stress" there is if you incorrectly use only one hand. Hand stress is gradually becoming a real issue for me, but because of mouse rather than faulty typing. My mouse hand wrist needs serious vacation. My customisations of keyboard behaviour involve only setting NumLk on or off at login on different machines, redefining Caps Lock, and making a few charsets available (Estonian, Swedish, Greek, and Russian; I never use US). This is already quite many elements of confusion, isn't it? Except in Opera I use practically no customizations other than Compose instead of Caps Lock. I exclusively use the US International layout. I've long since forgotten the Dutch QWERTY layout and I find AZERTY a horrible abomination. Okay, I get that certain characters might get different priorities, but did they really have to mess up the basic alphabet and numbers? I mean, it's not like these completely arbitrary differences make it actually better in any objective manner. Agreed. I've made that mistake myself. Indeed, it's practically the same as Shift. I'd say press the Windows/super key with your pinky too, but Alt with your thumbs. Actually the space bar could be a fair bit smaller, making room for an extra pair of thumb-activated keys like on a Japanese keyboard. Maybe that'd be good for something that acted like e.g. Ctrl+Shift, one of those inelegant bindings. Or maybe arrow keys? That way you wouldn't have to move your hands to do Ctrl + left/right while writing something. Although that'd work better if Caps Lock were Ctrl. Really depends on the keyboard though. Nobody's going to bother fixing some cheap piece of junk. Different story if the part in question isn't as easy or cheap to replace. What finger would be on Ctrl? Pinkie? That's what my left hand usually ends up doing. As far as I'm concerned most people seem to either severely underspend or severely overspend on mouse and keyboard. There are some real pearls in the <€20 range for what they are, with many more expensive models only adding on useless extra buttons to the exact same base keyboard. As such, any extra money spent is a total waste. 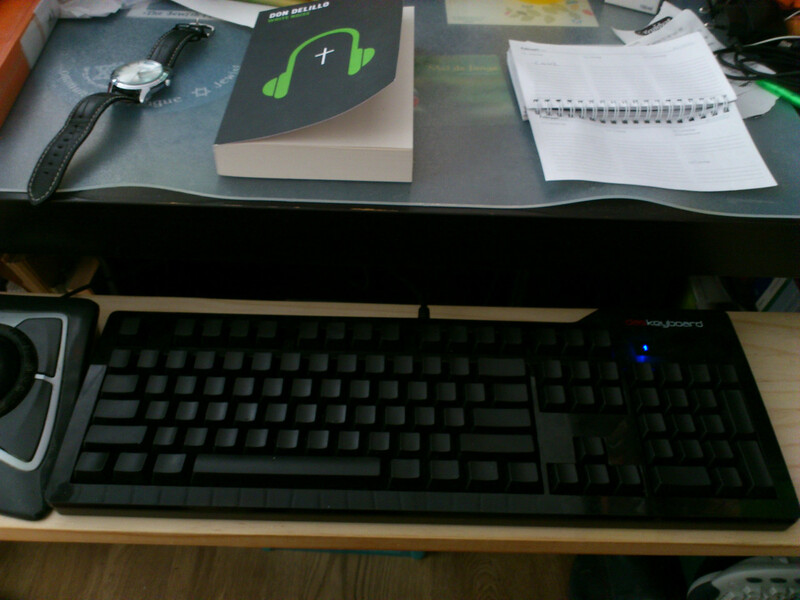 At the same time, however, the cheapest nicer keyboard you can find is probably the Cherry G84-4100 for €60-70ish. Keep in mind that the latter might last for decades (although maybe you'd better buy some spare switches in advance if you want to be sure?) while the former will no doubt be begging for replacement by the time you need a new computer. With mice things are a bit harder, but I can tell you cheaper trackballs aren't really worth it (except perhaps on the go). I use a Kensington Expert Mouse Pro* but right now the Kensington SlimBlade is probably a better buy. (NB I don't own it so I can't compare.) I don't use it because of mouse issues, but simply because I fell in love with it when I tried it. * Don't be confused by the name: it's a trackball. I am saved from too much mouse-stress by the fact of using touchpads (because they come with netbooks and laptops, duh) rather than mouses. At most I use mouse at work. I have a hint how to relieve (or postpone) mouse-stress. Instead of squeezing the mouse and pressing it to the table as it's normally done, I turn the mouse upside down, with its stomach towards the roof. I keep the mouse in my hand while my hand rests with its back on the table. This prevents tracking with the mouse, but buttons still work just fine, and scrolling too. When tracking is needed, I turn the mouse the right way again. This gives the hand some more mobility during work. Of course, cheap isn't necessarily junk and expensive isn't necessarily much better. Just last week I fixed a Logitech trackball ( you know, the old, beige, discontinued Trackman variant ) - it had lost one of the tiny steel balls that the big red ball sits on. Found a replacement, now it's back in service. I'd probably have ended up using one anyway ( my girlfriend at the time was a big fan ) but having a problem similar to what ersi described certainly added lots of motivation. That's incorrect. Primarily of course because finger or thumb is a matter of preference rather than objective fact, but what I'm actually referring to is that I use it as a bi-handed thumb-controlled trackball. It's just a finger-controlled ball by default. The clue is whether you use the top or bottom buttons for left & right click. Option          "ButtonMapping" "0 1 2 4 5 6 7 3"
I use top left & right for left & right click (default bottom left & right), bottom right for middle click, and bottom left for scrolling. The actual biggest problem is that the sensor is at the bottom, so any junk can fall right in. This results in something more like a ye olde mouse biweekly cleaning ritual than the months on end you might expect with an optical sensor. The Kensington Kingblade supposedly has the sensor on the side and an exit hole at the bottom to alleviate this issue. My wife's Logitech Wireless Trackball M570 is not a slouchy replacement. She had an old beige one (probably called Trackman) which started malfunctioning. Indeed, the old ones were just beige, I guess to match the keyboards Apple shipped back then. Actually, I never used one of these. Some of the Logitech ones have the hole, some don't. The sensor always seems to be off to the side though. Still needs occasional cleaning since dirt accumulates around the three steel balls that the main ball sits on. Sure, that'll always remain an issue. But that's just a matter of smoothness. That sensor at the bottom only needs a couple of hairs or some such to fall in just the wrong place to start running amok. There's a difference between quickly cleaning out a bit every week or two in order to have the smoothest experience and having to clean it out every week or two because otherwise your cursor will start moving more and more independently (or not at all). I have a Logitech Marble Mouse* with the hole at the bottom and I don't think the actual sensor's ever really needed cleaning. Just the ball bearings. This is a very interesting article about the myth of Dvorak. Right, thanks. In this particular case I thought it wasn't that bad. I knew what the last sentence was going to be already when I was at the intro. Since the beginning of the article there were indicators that the authors hate government intervention. Hate is the right word, because they bring it up without any proper context. This was not an article about keyboards, but about economics. I thank the authors for a nice story of the history of the keyboards, but the story was really meant to refute "the doctrine of path dependence" according to which the first player on a market "locks in" the market slot even when the product is inferior. The simplistic way in which the authors present this "doctrine of path dependence" suggests that no serious thinker can hold to this "doctrine", at least not in this shape. So the authors must be peddling a strawman. In which case the authors fail to refute the doctrine of path dependence, because they fail to address it. The last sentence makes it impossible to withhold the allegation of ulterior motives against the authors. Throughout the article, none of the examples imply anything about government intervention one way or another, but the authors end the article precisely by bringing up government intervention in a manner similar to "moreover, Carthage must be destroyed". I knew what the last sentence was going to be already when I was at the intro. Heh, you're right. Apparently I very successfully skimmed through and disregarded pretty much everything up to "The Fable". I'd basically managed to forget page 1 existed at all by the time I reached the end. The print page makes it easier to keep track of the whole content, for sure. What's the best way to type? From the tutorials I am getting the impression that we are supposed to press specific keys with specific fingers, as in the image. "F" should be pressed only with the left index finger and nothing else and similarly there's a specific finger assigned for every other key too. This doesn't seem right to me, because the scheme in the image requires too much labour from the index fingers. Index fingers are (on ordinary humans) significantly shorter than middle fingers. Due to their length, it would be quite natural to give middle fingers much more work to do - which is how I in fact am used to type. Moreover, when index fingers are overburdened, sequences like UNB or GR are near-impossible. The "wrong" way of typing is much more creative - look at/think of the word you are about to type and devise the most convenient hand movement for it. After some practice, the devise phase takes no time at all, and the practice is no harder than the standard typing scheme. Then there's also the fact that we have key combos, like Alt+Tab or Ctrl+Alt+Esc. These must be, as a matter of necessity, be typed the "wrong" way. All in all, in my opinion the "wrong" way is not wrong at all. It's properly creative and based on convenience derived from pragmatic necessity. Just like on piano, you cannot press the same key always with the same finger. It depends on what you pressed just before and what you will press next. It's certainly true that (almost?) no experienced touch typist will stringently follow such a scheme, but of course one "devises" how to type about as much as how one "devises" how to breathe or walk. A grave design error in many an ergonomic keyboard is that they will cleanly split along the lines indicated in your image, while (almost?) any experienced touch typist will "spill over". That being said, I see no difficulty in typing unb or gr with my index fingers and that's how I would do it. As a general rule I would put 3 and 4 as well as 8 and 9 with the middle fingers, 0 with the ring finger, and 6 with the left hand. Quite likely that experienced typists spill over the prescribed areas a bit. But I wasn't talking about experienced typists, as in secretary training. I was talking about why most people type the way they type, in a totally different way. You know, when people learn to play the piano on their own and become a virtuoso, they end up playing the classical way by necessity, because the classical way happens to be common sense. Not so with typing. In typing, the common way is far away from the prescribed way. When ordinary people type, they hardly ever use the same finger to type two keys in succession. For the next key there's always the next finger. I am thinking of a way to make a science out of this. I disagree with your suggestion that a method involving more than just a few fingers wouldn't be similar to your prescription image at least in principle. Although the physical layout of the keyboard is somewhat suboptimal, having more or less dedicated finger areas is surely the fastest and most efficient. * In the English-speaking world le mot juste seems to be words per minute (WPM), where a word is defined as five characters. ** The Wikipedia article on WPM suggests two-finger typists can burst to over 400 CPM, but it doesn't define burst duration.